Most of the bright dorms and rooms at Don Moustache open onto a small terrace. There is a shared bathroom and lockers. One private room with an en suite bathroom is available. You can relax in the Moustache’s lounge, where there is a TV as well as computers. Guests are invited to enjoy breakfast with hot drinks and fruit every morning. Plaza de Catalunya and the famous Las Ramblas are less than 900 metres away. The beaches at Barceloneta are just 4 stops from Girona Metro Station. Airport trains leave from nearby Passeig de Gràcia Station. Please let Don Moustache Boutique Hostel know your expected arrival time in advance. You can use the Special Requests box or contact the property. If you expect to arrive after 00:00h please inform the property in advance. Laundry service is available at an additional cost. 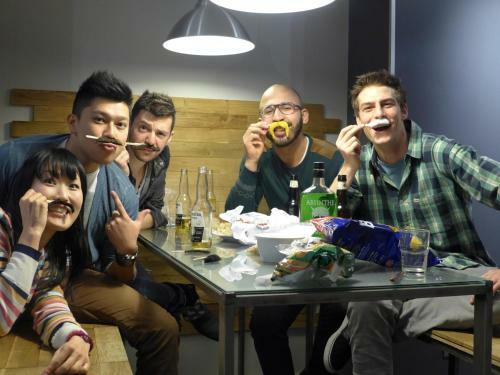 Don Moustache Boutique Hostel provides a shuttle service to Barcelona Airport at the extra cost of € 14 per person. Fares include a suitcase and a piece of hand luggage. For collection from the airport please send an email to the address on your booking confirmation with name, flight number, date and arrival time. This bright dorm opens onto a small terrace, and includes free Wi-Fi, lockers and a shared bathroom. Rate: € 28.50 ... € 51.00; select dates below to get current rates. This room has 2 single beds and an extra bed is also available on request. The room comes with a coffee machine, kettle and hot chocolate. There is a private bathroom. Please note this room does not open onto a terrace. Please note, guests will receive a complimentary bottle of cava upon arrival. Rate: € 104.50 ... € 145.00; select dates below to get current rates. This bright dorm is dived in 2 separate areas. 1 area with 2 bunk beds and another area with 4 bunk beds. It opens onto a small terrace, and includes free Wi-Fi, lockers and a shared bathroom. Rate: € 32.30 ... € 56.00; select dates below to get current rates.